Beebe Healthcare and the state of Delaware rank among the best in the nation when it comes to providing quality maternity care, according to the Maternity Practices in Infant Nutrition and Care (mPinc) survey completed by the Centers for Disease Control and Prevention (CDC). Beebe Healthcare is proud to deliver nearly 1,000 babies each year. Each “Beebe baby” and his or her mother is treated to advanced maternity practices, including delayed cord clamping, delayed first bath, rooming-in for mother and infant, and practices that support a successful start to breastfeeding. Beebe Healthcare is the first organization in Delaware to earn the international Baby-Friendly Hospital designation, launched as part of the Baby-Friendly Hospital Initiative (BFHI) in 1991 by the World Health Organization and the United Nations Children’s Fund (UNICEF). Beebe received the designation for its commitment to breastfeeding and evidence-based practices. The recent survey by the CDC ranks Delaware as second in the nation, just behind Rhode Island. Delaware received perfect scores for breastfeeding education, lactation support, and rooming-in, which is the practice of keeping moms and babies together in the same room throughout their stay. Beebe’s overall score on the mPinc survey was 96 percent, higher than the national average of 95 and higher than the Delaware average of 93. Beebe received a subscore of 100 in the areas of Labor and Delivery Care, Postpartum Care – Breastfeeding, Postpartum Care – Breastfeeding Assistance, Postpartum Care – Contact Between Mother and Infant, and Structural and Organizational Aspects of Care Delivery. 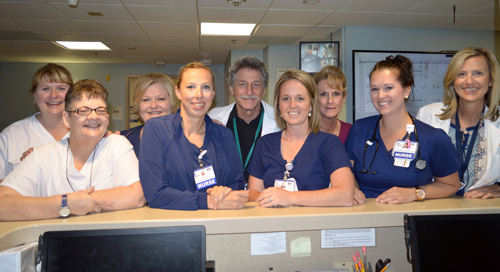 In addition, Beebe received a score of 88 in the areas of Facility Discharge Care and Staff Training. All facilities that provide intrapartum or maternity care in the United States are invited to participate in the mPinc survey. For more information about the mPinc survey, go to www.cdc.gov/mpinc. For more information on Beebe Women’s Health Services, go to https://www.beebehealthcare.org/womens-health. Beebe Healthcare is a not-for-profit community healthcare system with a charitable mission to encourage healthy living, prevent illness, and restore optimal health for the people residing, working, or visiting in the communities we serve. It offers services throughout Southern Delaware for residents and visitors, including a 210-licensed-bed hospital, a cancer treatment center, and outpatient facilities providing walk-in care, lab, imaging, and physical rehabilitation services. For more information, please visit us online at www.beebehealthcare.org. Find out more about Women's Health at Beebe or join the discussion about Women's Health on our microsite! Caption: Shown are some members of the Beebe Women’s Health team: in front (left to right) Teresa Fritz, Courtney Stoeckel, Crystal Reynolds, Shanna Zickgrahf, and Women’s Health Executive Director Bridget Buckaloo. In back are Michelle Dwyer, Certified Lactation Consultant Nancy Hastings, Medical Director Dr. Steven Berlin, and Vicky Mallet.